Ever wondered about Koorliny Arts Centre’s beginnings? We asked administration officer and Kwinana Dance Festival coordinator Ruth Alexander, who has been working at the centre for nearly 25 years, to tell us a bit about the centre’s history. The purpose-built Kwinana Community Arts Centre opened on March 21, 1991. One of the State’s first arts centres, it was opened by then Kwinana Mayor David Nelson, who described the centre as “the culmination of many years’ hard work”. He invited the community to “use the arts centre and to be part of its success in the future”. Then Arts Minister Kay Hallahan said the centre had a “bright future as a catalyst in stimulating local creative talent” and would “unite people of all ages and backgrounds in the pursuit of artistic and cultural objectives”. At the opening ceremony former Peel MP Norm Marlborough dedicated the time capsule, which was buried in the centre’s garden. The now-disbanded Kwinana Theatre Workshop (aka KTW, which formed in 1969 – click here for more information) moved into the centre from their former home in Medina, leasing Theatre 2 as their new home. Their dedicated and passionate members set to work equipping this purpose-built space with a stage, curtains, sound and lighting equipment – even the chairs were purchased with donations from members. KTW’s faithful audiences followed them to the centre to watch Sweet Charity, and for the next 22 years, the theatre group put on several shows a year. Sadly, the group disbanded in 2013. In 1993, the Friends of the Centre incorporation was established to promote interest in all forms of arts and crafts. The Friends also volunteered as ushers and quickly became an essential part of the centre’s operation and a lively social group in their own right, holding many fundraising activities to purchase much-needed equipment for the centre. “If it wasn’t for KTW, we probably wouldn’t have this centre,” Ruth said. 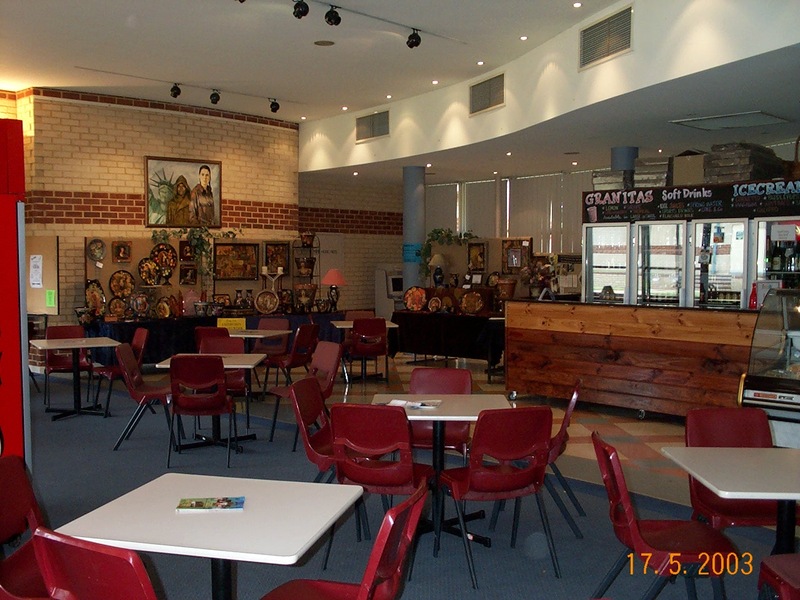 After it opened, the centre was also used as a drama and performing arts learning space for Kwinana Senior High School (now Gilmore College) students, and was home to the Kwinana Camera Club and Kwinana (now Koorliny) Leisure Painters. The painters still use Studio 1 every Tuesday morning and their paintings are displayed in the foyer. Thanks to former general manager Ian Ashton’s passion for getting the community involved, other groups soon made the centre their base; the Acorn craft group, have remained loyal to the centre for more than 20 years, even though their numbers have dwindled. At one point the Acorn group had more than 30 members, all knitting and crafting at tables in the foyer. Another long-standing group is the Tai Chi social club, which still meets on Mondays. The Kwinana Dance Festival was first held at the centre in 1993 and continues to be a big drawcard on the dance-competition calendar. When it first started it was held over two days – now the festival runs for around 11 days! Many dancers will remember maintenance man Stuart, handing out lollies and signing certificates with his fountain pen backstage during the festival. In addition to KTW shows, the venue was hired by touring artists and other theatre groups. Shows like Menopause, Rent, The Full Monty, Honk!, The Little Shop of Horrors were among the many staged in the centre over the years. In April 2008, the centre was remodelled and rebranded Koorliny Arts Centre. According to the Noongar Dictionary, Koorliny is an action word meaning “coming together”. The name was chosen to depict the Centre as a place to come to for inclusion and opportunity. At a function celebrating the rebranding, Board chairperson Lynne Woolfenden said Kwinana people could feel very proud of its strong community links and she hoped they would view the centre as a key place to visit. Along with the name change, some new community programs were added to the mix, such as Shortfuse Youth Theatre, Kwinana Children’s Choir, the Koorli Kids’ Club with Koorli Koala, the Boys and Girls Club, and Dance 4 Africa. Anyone remember the Kwinana Community Spectacular? Or the big sleep-over in the centre? Live ‘n’ Loud in the Amp? The 20thbirthday celebrations in 2011? Since Ruth has been working at the centre, she has noticed more interest in cultural activities from locals. “When I first started, Kwinana was a blue-collar, low socioeconomic (area) and culture and the arts was not a high priority for the majority of the population,” Ruth said. “To get locals to come was like getting blood out of a stone — we got more people from Rockingham or Mandurah. This change has continued as Kwinana has evolved from a small country town with just a few thousand residents, to a busy, multi-cultural city of 42,000-plus – this growth is set to continue exponentially over the next 30 years. When Ryan Taaffe stepped into the role as general manager in 2011, taking over from Ian Ashton, he took on the task of establishing the centre as a producer of high quality community theatre and entertainment. The centre is now known for delivering high-quality in-house and touring productions, including producing award-winning musicals such as The Little Mermaid. In 2016, the centre was given the Yvonne Hough Nielsen Memorial Award at the Finley Awards for “sustained excellence in staging outstanding musicals over many years and for being a significant cultural destination in the Kwinana area”. It’s also the home of the annual LyriK awards, dance concerts, Instep Performance Academy, Wellard School of Music, and more. The centre celebrated its 25th anniversary in 2016 with a blast-from-the-past exhibition featuring newspaper articles, photos, posters, and costumes and old props. And the time capsule was opened by current Kwinana Mayor Carol Adams and board chairperson Lynne Woolfenden, revealing memorabilia, letters, artworks, show programs and more. Mayor Adams said the centre had been central to the development of the arts culture in Kwinana. “Koorliny is now well known for high quality theatre and live performance – wowing audiences from far and wide,” she said. Current general manager Kate McIntosh thanked all who had been involved with the centre’s history. “The dedication, commitment, creativity and talent of volunteers, staff, board members and the community has made Koorliny what it is today,” she said. What memories do you have of the centre? We’d love to hear in your comments below. Having done many many shows at the Koorliny Arts Centre over the last few years, it has become a special place for me…and sometimes, a second home. Thanks to everyone for making it a wonderful place to spend time and for putting on outstanding theatre for Perth audiences. In particular Kate, Jon, Ryan and staff. Thanks, Rachel. It warms our hearts to read this – we hope others feel that way too.